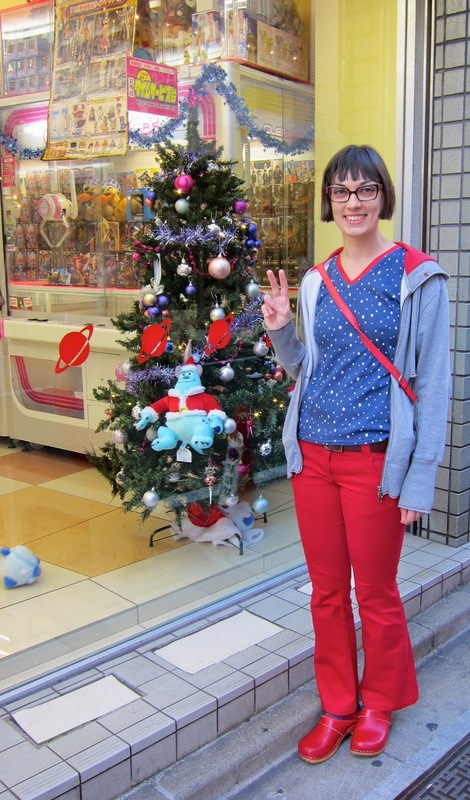 Since November 1st, Japan is ready for Christmas! Every single shop is displaying Christmas decorations, flower shops sell wreaths and Christmas trees - madness! Yet it is still 20C and people are wearing t-shirts! My growing interest in knits could not be outshone even by couture sewing. During the week at the seminar, everybody (including Susan) was wearing knits on a daily basis. Nobody can deny that knits are much more comfortable for an active lifestyle; they don't need to be perfectly fitted, they are easy to look after and not difficult to sew. I asked Susan many questions about knits but she does not sew with them much and suggested that I take a Craftsy lesson or read books regarding this subject. When I returned home from New York, I purchased this wonderful book by Kerstin Martensoon, It's easy to sew knit and stretch fabric. This book helped to dispel a couple of myths about sewing with knits which I had previously believed, such as the idea that one should only sew knits with specific thread for knits, and that a serger provides a better finish. As a test knit garment, I took on this t-shirt from the HomeSewn book which I previously reviewed here. 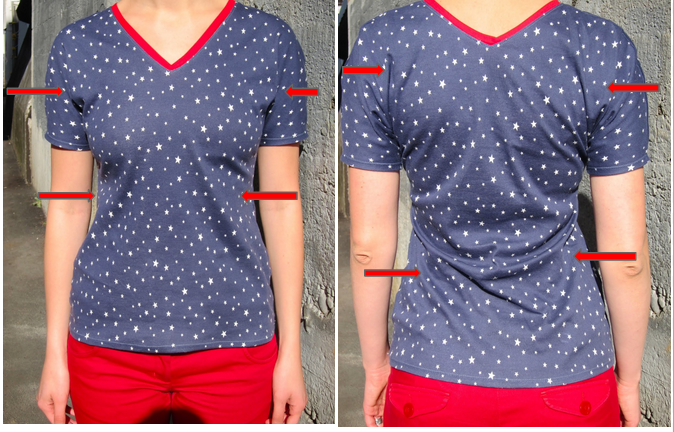 The design is very simple: one front piece and one back piece with integrated sleeves + bias binding around the neck. The only two changes I added to the S size was to lengthen sleeves and bodice by 2cm each. I used mainly zigzag and tricot stitches and I finished the hems with a double needle. For the bias binding, I used pre-made band. Only after I started attaching the band did I realize that my t-shirt looked like the American flag, but I hope it's not that bad after all. Only after putting the tee on did I notice multiple flaws. I am not sure whether it's because I did not make the muslin or because something is not quite right with the pattern. Could it be both? If I make this t-shirt for a second time, I'd definitely take off some armsye fullness, add a couple of centimeters at the bust and reduce the waist a bit. P.S. I won't post for the next few weeks. When I came home from the sewing class in Baltimore, I discovered that my mom has breast cancer and that she needs surgery. The six-week sabbatical scheduled for sewing and relaxing is extended until the end of the year, most of which I'll spend at my mom's side. Of course, we never think that something like this will happen to us, but when it does everything changes and life takes a new turn. It's probably a very stupid thing to say, but if you or your mom have not had a mammogram in a long time, please do so! My mom is a doctor yet she had never gone through this procedure before, and now one of her breasts will be removed. Hopefully everything will go well and I'll give you an update soon! I wish the best to your mom!! Hope everything will go well after surgery! All the best for your mum and her upcoming procedure(s), that is really sad news! You're totally right... it always seems to happen to someone else, doesn't it? Except when it doesn't! My heart goes out to your mom! Please take this time to be with her and I will keep you in my prayers. Seriously. Oh, lady, I'll be praying for you and your mom. You'll be in my thoughts for sure. And your t-shirt is a great start! The little folds by the bust in the front are really common with knits with cut-on sleeves. I'm interested to hear if you find a fix for them. Sorry to hear the home-front news. My condolences and all the best for everything to come - a friend went though that recently and it seemed quite an ordeal but she said it was very important that she kept a positive attitude towards everything-it helps with the recovery. Having the family around also helped so the very fact of your presence will make a massive difference I'm sure. Just keep talking to her and keep her spirits up. 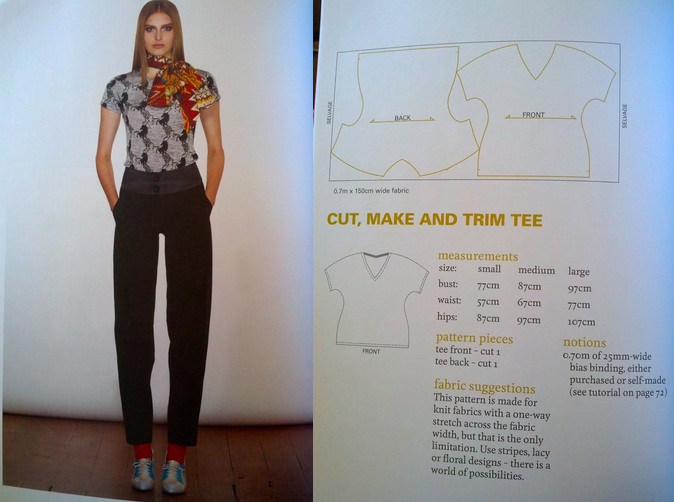 Re your tshirt it looks wonderful I have that book but haven't gotten around to making any of the patterns up yet. I'd suggest comparing the fit to a pre-existing garment in the same style or to your sloper block and then pinning/ folding out the excess. Best of luck with everything. Thanks for your support! I am sorry if my post turned up to be too personal at the end. It's good to be together with my mum (finally!) and not 10,000km away from her. I couldn´t agree more on testing. I really keep my fingers crossed for your mom. Certainly having you close will help and it´s great you can do it. From my heart, my thoughts are with you and your mom.